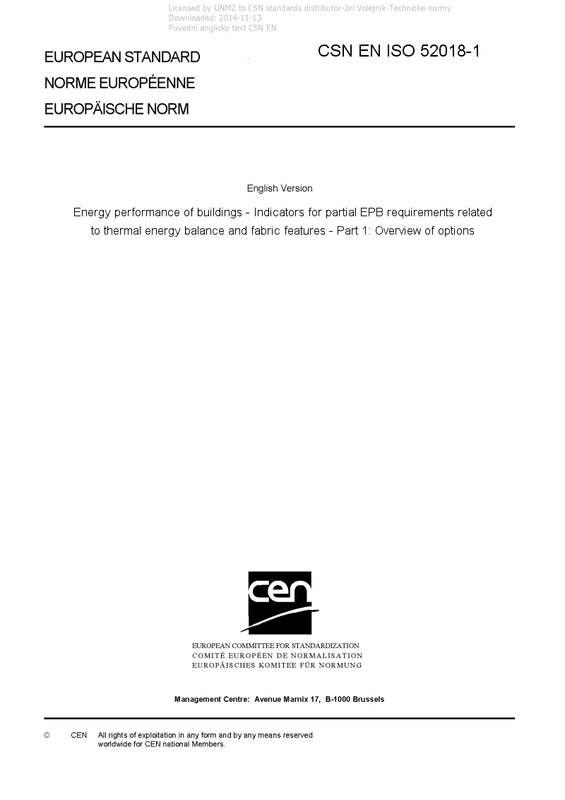 EN ISO 52018-1 Energy performance of buildings - Indicators for partial EPB requirements related to thermal energy balance and fabric features - Part 1: Overview of options - The set of EPB assessment standards produces a great number of overall and partial EPB indicators as outputs, which can be used for different purposes. ISO 52018-1:2017 deals with the use as requirement of partial EPB indicators related to the fabric and related to the thermal balance of the building. Thermal balance aspects concern both the heating and cooling needs and the free floating temperatures, especially with respect to overheating or too cold indoor temperatures. ISO 52018-1:2017 can support both private parties and public regulators (and all stakeholders involved in the regulatory process) with the "post-processing" of these outputs. ISO 52018-1:2017 provides standardized tables for reporting, in a structured and transparent manner, the choices that are to be made with respect to the partial EPB requirements covered by ISO 52018-1:2017. The tables are non-restrictive, thus allowing for full regulatory flexibility. NOTE Table 1 in the Introduction shows the relative position of ISO 52018-1:2017 within the set of EPB standards in the context of the modular structure as set out in ISO 52000-1.